You found us! Tantalizing, mouthwatering dishes are just a few clicks and ingredients away (not to pat ourselves too much on the back or anything. We like to maintain a healthy sense of humility). 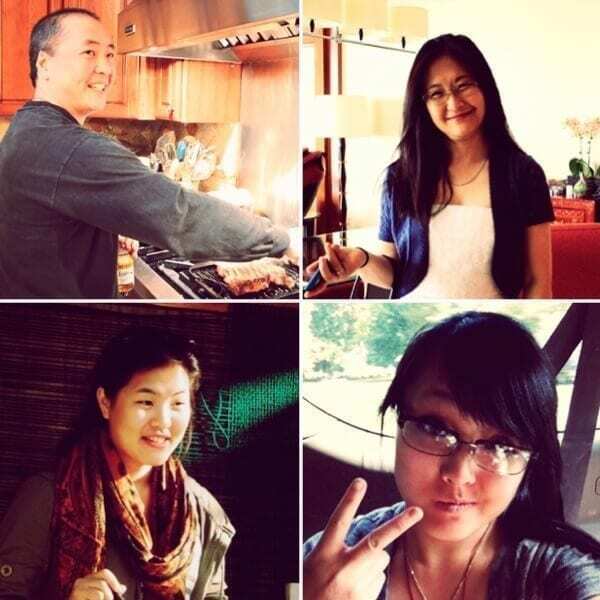 We are a family of four (Bill & Judy, and daughters Sarah & Kaitlin), and The Woks of Life is our way of sharing our recipes & travels with each other and the world. This blog is for anyone looking to try their hand at Chinese cooking as well as other great recipes, Asian or otherwise. Whether you’re a food lover interested in going beyond Cream Cheese Wontons and Sesame Chicken, a college student with a drawer full of wrinkled take-out menus and only rudimentary knowledge of how to boil an egg, or just someone looking to make weeknight dinners a little more interesting, you’ve come to the right place. All four of us have been cooking and serving meals for many years. Allow us to quickly introduce ourselves: Bill (the family patriarch) grew up working and cooking in restaurants, including years of experience at his own parents’ Chinese takeout joint, which is why you can be sure our American Chinese takeout recipes are legit! Judy (the matriarch) was also known to help out at the restaurant, regularly scours Chinese cookbooks for new ideas, and wants to keep traditional recipes alive for new generations of home cooks. Sarah and Kaitlin are twenty-somethings living in New York, who grew up cooking from a young age, learning from grandparents, their very cool parents, and of course, food TV. Bill: Grilling steaks for fifty people at a family party, Corona in hand. Judy: Heading out for brunch in Beijing. Sarah: Awkwardly stirring cheese curds at a Pennsylvania renaissance fair. Kaitlin: Chillin’ in the way (way) back of the family truck, whilst older (read: higher ranking) cousins chill up front. The fact that we all cook can admittedly lead to the odd kitchen squabble (*scroll down for embarrassing illustration of said phenomenon), but we make it through okay. We bond over and overanalyze our food, think about what to make for dinner before lunch is over, and remain relentless about perfecting our favorite dishes. The Woks of Life was born in 2013, when half of our group––the parental half––relocated to Beijing. Kaitlin was in college stateside, and Sarah began moving between both China and the U.S. whilst figuring out the meaning of post-college life. Between all the plane rides and intermittent Skype conversations, it became difficult to stay up-to-date on all of our day-to-day comings and goings, let alone what we were each preparing for dinner. We also realized that the kid-parent separation led to said kids eating a lot less of the Chinese food normally served up by said parents. Because let’s face it…though the two daughters of this family can make restaurant-quality thin crust pizza like nobody’s business, they hadn’t exactly been studying up on dishes usually left to the older generation. Our solution? This website and blog, where we could share recipes, kitchen exploits, and travels. We’ve kept it going ever since––even now that we’re all back in the Northeastern U.S. Our recipes represent our own culinary genealogy, from the simple to complex, the traditional to the reinvented. So take a look around. Pour a beverage and find tonight’s meal. Pick up some travel tips, wok shopping advice, or an explanation of what the heck Chinese black vinegar is. *An example, just for illustrative purposes. We’re not like this all the time. We swear. Grew up in upstate New York delivering newspapers, shooting marbles, and accidentally crashing questionably maintained snowmobiles into neighboring garages (okay, just the once). Had a few stints in the restaurant world, rising from modest beginnings as a Burger King sandwich assembler to Holiday Inn busboy and line cook, to cooking at his family’s Chinese restaurant, while also learning the finer points of Cantonese cooking from immigrant parents. Born in Shanghai, and arrived in the U.S. at age 16. Pretty much a boss when it comes to languages, being fluent in both English and three separate Chinese dialects. And boy, can she fold a spring roll (the rest of ours tend to just fall apart. It’s sad). Plus, she’s the only one in the family who’s actually good at reading Chinese, so she’s our professional menu-translator when we’re eating our way through China. Born and raised in the Garden State, growing up on episodes of Ready Set Cook and Iron Chef. Writer, photographer, marketing professional, and daydreamer, with a penchant for Quick and Easy recipes that take less than 20 minutes to make. Like the rest of the family, she loves the outdoors and writing delightfully detailed posts about the Art of Cooking Outside. Notoriously unable to follow a recipe (usually preferring to freestyle it), Kaitlin’s the family artist, chunky-sweater-obsessed knitter, and keeper of an unreasonably detailed knowledge bank of Korean pop music. The master of all things sauces and condiments on the blog (her chili oil is legendary) and steward of our drool-worthy Instagram account. Just discovered you!!! Love your ingredients list and how to use them. Perhaps you can help me find a recipe. We once lived in Penang, Malaysia in the early 90’s. (Heaven on Earth!) Every weekend we would visit a little shop called New Shanghai, sit on little stools on the sidewalk and enjoy what they called “Sour Soup”. No noodles but a wondrous broth, sour and spicey but mellowed by the roast duck wings and necks that cooked in it And there were vegetables… pickled? fermented? Kim Lai, who always looked after us there, would always see that our bowls were topped off and ensure us that if we drank enough of the hot tea, it would flush away any duck fat! Good times! How I would love to find a facsimile of that soup! Also, your “hot tea flushes away duck fat” point is awesome. It is a Peranakan dish called Itek Tim, itek is duck. It is a duck soup cooked with salted mustard greens (kiam chye),tamarind and sour plums. Hey Neil, yes we in America are for whatever reason still rejecting the metric system. We have it on our list to add metric measurements to all of our recipes, but with over 500 recipes to go over, it might not happen any time soon. Luckily, there are really helpful measurement converters available on the internet! Do you have any ideas on how to make Black Sesame Pudding like soup? Recall my mom used to use blender to grind white rice and toasted black sesame added rock sugar and boiled but do not know the proportions or recipe. Hi Suju, are you referring to 芝麻糊? If so, I do know how to make it. Love this webs site! It’s so helpful and useful. I love the recipes, the way the ingredients are explained and how to find them, the list of essential tools, the pictures, and of course, the recipes. Thanks for making my life a little better. I came across your website and now know what I did wrong in trying to make Chinese Pork Buns. Great website and will definitely be making other authentic Chinese dishes using your receipts. I can relate with your Mom as I also came from China (Shanghai area) in 1952 (actually smuggled out with Mom to HK) as a 4 year old, I grew up in the Chinese restaurant business my father owned for over 30 years in the 60s on the lower east side of NY, managed it part-time and dabbled in the kitchen with the Chefs. A group of us worked at Grossingers and Kutchers in the Monticello area as waiters and bus boys, as their fathers were head chefs. As a retired bank executive I know have plenty of time to make these Cantonese dishes that my family enjoys so much. Keep up the great website. I really like your boards and web pages, such awesome recipes and information. My favorite boards are Judy’s as I like the way she organizes them, it is so easy to find a recipe for anything. Your board Drop Dead Gorgeous Desserts is truly a work or art. Thanks for all the effort you all put in to make your recipes available to the average Canadian aspiring cook. Your glossary is very helpful as there is such variety in the flavour of your recipes it is sometimes overwhelming. You are great! I am Chen live in Quebec giving asian cooking class in French. Your website gives me a lot inspiration! Well down! Keep doing this incredible, organized and practical work!! !